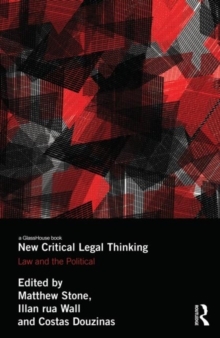 New Critical Legal Thinking articulates the emergence of a stream of critical legal theory which is directly concerned with the relation between law and the political. The early critical legal studies claim that all law is politics is displaced with a different and more nuanced theoretical arsenal. Combining grand theory with a concern for grounded political interventions, the various contributors to this book draw on political theorists and continental philosophers in order to engage with current legal problematics, such as the recent global economic crisis, the Arab spring and the emergence of biopolitics. The contributions instantiate the claim that a new and radical political legal scholarship has come into being: one which critically interrogates and intervenes in the contemporary relationship between law and power.